The thesis midterm went well, with great criticism from Marko, Sven, and Ted. I have attached my thesis presentation below as a PDF for all to enjoy. Lots of work left to do, though. Hopefully, I'll be cranking out a new prototype, for straight linear measurements, within the week. It could be used for anything from height measurement to blood pressure. I was assigned to go into a NYC neighborhood and document what I noticed about the type. What I found, in Chelsea and Hell's Kitchen, was a lot of kitsch, in Kundera's sense of the word. So much of the type in the newest presentations refers back to old industrial or distressed type, but in a way that is knowing and safe. It simultaneously induces a frisson from the decayed and supposedly dangerous in a New York working-class neighborhood, while letting the observer in on the joke. To reformulate the quote above, the two tears are how nice to be in a tough NYC neighborhood and then how nice to know, together with all mankind, that we are in a tough NYC neighborhood. ScanBand v0.5 -- Now With Less Width! This is the newest version of the ScanBand series of arm-measuring devices. This time around, I've made it as narrow as I think it can possibly get. The measuring numbers were turned 90 degrees and laid out side-by-side along the edge. The bar codes are the same size as version 0.4, but I think this is as small as I can make them while still allowing for them to be scanned. Attached is the zip with the PDF and the SVG file. It's made available under the Creative Commons Attribution ShareAlike License version 3.0, copyright 2007 Mike Edwards and Baobab Health Partnership. At last, version 0.4 of my ScanBand prototype has rolled off the presses (or, at least, the printer in the lab.) This version tossed out the color strip, which turns out to be less useful than I had hoped. It is also significantly narrower, making it more like existing mid-upper arm circumference measuring devices. There is also a window alongside the scanning window that displays the millimeter measurement in numbers, so that the band is still useful in situations with computers or power. Even more importantly, the version is able to be print two ScanBands completely on a single 8.5x14 inch sheet of paper, BUT can also (potentially) print out on a continuous roll from a 3-4 inch wide label printer. I'd really like to test this latter scenario in Malawi, since the good folks at Baobab have indicated that this might be a great way to print these out as needed. Attached to this post is the zip file with the PDF of the most recent version. ScanBand v0.2Thursday night marked the first presentation of my thesis work to outside critics. It went well, despite a snafu with the barcode scanner that prevented the ScanBand from displaying its results on screen. As a non-digital user scenario, though, it was fine. For me, the annual New Yorker Style Issue is usually thin on content and long on made-up 15 year olds looking studiously blase about their Burberry togs. But this issue featured an article by Henry Alford called "Solar Chic," where the author user tests a Zegna bomber jacket with removable solar panels in the collar. The solar panel fed a battery in the breast pocket which, in turn, would charge standard 5-volt devices like music players and phones. The piece could almost be a case from the Knight et al. paper. I've been doing a lot of work on anthropometrics, and I found the articles for this week to be really helpful for my thesis research. I have been thinking about how to measure vital signs on a patient's body in a way that is inexpensive, accurate, and user-friendly, both for the patient and the technician. Equally important, however, is that a measuring device should be wearable, by the authors' definitions, if only for a short time. In "The Comfort Assessment of Wearable Computers," by James Knight, et al., the authors invented a multidimensional test for describing the feelings of comfort or discomfort for a wearable device. I'm a freak for numbers and hard data, so it's nice to have this tool available to me for evaluating prototypes. I am especially glad to see how the evaluations are broken down, getting rid of the unhelpful, single variable comfortable/uncomfortable and allow researchers to get more toward the point of what actually is making the user uncomfortable with a device. More specific to the design of the devices themselves, in "Design for Wearability" Gemperle et al. delineated the constraints for device placement, form, allowance of movement, peripersonal space, attachment, and several other considerations. For me, this could work as a checklist as I create new devices and wearables, making sure I've considered all of the problem areas. I especially appreciated their breakdown of good places to site the devices, which helps give me a starting point for how to shape and attach them. I think the Dunne and Smyth article sums up something for me that I have been thinking about for a while. For a wearable to be successful, in my opinion, it must be peripheral. In their terms, it must be something that is subconsciously processed but not attended to. Important input from the wearable may be perceived by the user and later attended to, but it should otherwise fall into the background noise of the rest of the world. With all this in mind, I conducted a little experiment with some equipment I picked up at Modell's, a local sporting goods chain store. I picked up a set of Adams Forearm Pads, Adams Football Pants, Adams Football Thigh Pads, Adams Neck Roll (flat contour), a pair of Trace Hand-Guard Plus, Nike Dri-FIT Sliding Pad, and a Nathan L.E.D. Wrist Runner. I put on the pants with the thigh pads inserted, put the forepad on my left forearm, the sliding pad on my upper right arm with the thickest part on my tricep, put the neck roll loosely over my shoulders, and put the hand guard on my left hand. 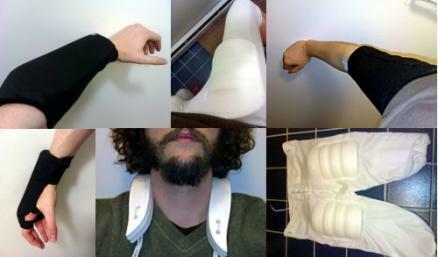 Then I performed ordinary tasks to see how I reacted to these additions to my body in daily life.